There are many types of food you can try while traveling in Japan but one of the interesting cuisines you should not miss out is the Japanese “chuka”. Chuka 中華 is short for Chuka Ryori 中華料理, mean Chinese food. It may sound just like another Chinese food that you have in your home but the Japanese Chuka in Japan do not taste like the one back home. The Japanese Chuka in Japan has tailored to the local palate, and the recipes are neither purely Japanese nor Chinese but rather a unique blend of both, the bottom line is still very yummy. Chuka can be found all over Japan and the price can be very affordable too. During my stay in Lake Biwa/Biwako in Kyoto area, we had the Japanese Chuka for my dinner. The Chuka restaurant that we went in is the fast food chain and you can tell it isn’t very expensive by judging from the setting. The price ranges from 350 yen to 800 yen (USD 3.20 to USD 7.30) per dish, depending on what kind of dishes you order. Let me show you what we had for the Japanese Chuka. Gyoza, Chinese called it Jiaozi and in English, it is the half-moon-shaped dumpling. The Japanese gyoza usually pan fried one side similar to potstickers but it does have some differences; Japanese gyoza made from tinner wrapper and the size of the dumpling is also smaller and more delicate. Karaage Chicken is usually boneless and deep fried with starch and been marinated with soy sauce. The meat stays juicy on the inside while being covered in a crunchy texture. Karaage is usually served in a plate with fresh chopped raw cabbages and mayonnaise. The shrimp was first deep fried with a thin layer of flour and then served with sweet mayonnaise. It is another popular dish in Chuka restaurant in Japan. Another top choice for shrimp is Ebi Chili. The meat is cut into slices and very thin strips and stir-fried with bamboo shoot, Japanese green pepper & oyster sauce. Note, the Japanese green pepper is very small in size and tasted very different from the green pepper we have back home. It looks less plump and more narrowly shaped. The skin is also thinner but the taste is super sweet. I don’t like green pepper back home but I am able to eat green pepper in Japan. The original version of Green Pepper with meat (from China) does not include the bamboo shoot. Mapo tofu is a very popular dish in Chuka restaurant in Japan. The origin of this dish is from Sichuan province China and anything related to Sichuan you know is spicy hot, oily and bright red. However, the Mapo tofu in Chuka restaurant has changed its version to tailor for local palate. The sauce is made from miso, soy sauce, sugar, chili paste, and soup stock. It did not use any fermented black beans. The verdict is it tasted super yummy, still can be spicy and it sauce goes so well with steamed rice. One of my favorite in Chuka restaurant in Japan. The other day I was in a Japanese udon restaurant and saw their special menu of “Mapo Tofu Udon” so I ordered and tried it out. Well, I still prefer the Mapo tofu with hot steam rice. I find Mapo tofu did not go so well with udon as it becomes too sticky, the udon and the Mapo tofu sauce does not fit. Anyway, you can see how much Japanese people love Mapo tofu. They even use it as udon topping. The Chuka or Chinese cuisine in Japan certainly taste different from our Chinese food. If you want me to name some Chuka iconic dishes; that will have to be 麻婆豆腐 Mapo tofu & 青椒肉絲 Qing jiao rosu/green pepper stripe meat. These two are the signature of Chuka Ryori in Japan. To name other popular Chuka dishes are Chahan/Japanese fried rice, Hiyashi Chuka – a popular summer dish which is served chilled with ramen noodle; Ebi chili – shrimps cooked in a sweet chili sauce. I regretted not ordering the Ebi chili! At the end of the meal, do not expect any fortune cookies given. I think fortune cookies only happen in America. Not in any part of Asia. Have you tried any Chinese food before and what is your favorite? Shrimp in Sweet Mayonnaise looks really delicious. I would love to try this one out. Another option for shrimp is the Chili Ebi or Shrimp Chili. Not to be missed if you are in Chuka restaurant in Japan. They serve Kimchi on the side? I think this looks like Korean food. Haha! In Korea, they say mandu instead of gyoza. Anyway, I’d love to try the Shrimp in Sweet Mayonnaise. Japan is one of my favorite places in the world. I love their culture and cusine. Tokyo is my favorite city. Glad to learn that you love Japan and Tokyo is your favorite city. For me, I prefer to stay away from Tokyo due to the crowd and lack of spaces. However, I still very much in love with Japanese food, regardless of what kind of Japanese food, be it Chuka, Japanese kaiseki, Indo ryori, Japanese western, udon, ramen or sushi. Such a great post! I love trying new foods and especially love Asian! Now that would be a fun and delicious place to eat! I would love to try out their food! 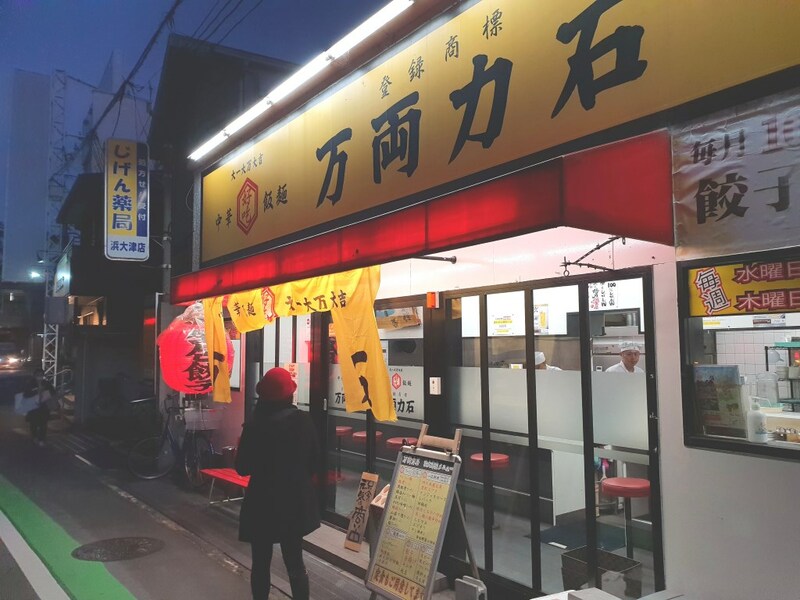 Chuka can be seen everywhere in Japan and great place to have your meal, cheap and delicious. Don’t forget to order some of the signature dishes from Chuka menu, usually the top selections are “mapo tofu”/hotpot tofu, chahan-fried rice, chili shrimps and green pepper with meat. I’ve had a shrimp in mayo and gyoza before at a few Chinatown restaurants in NYC, but those dishes don’t seem to be common where I live. Japanese love shrimp mayo also and they mayo do taste different, sweeter I feel than the Chinese mayo. I love Japan! Their culture and Foods are Amazing, The Food looks so yummy it makes me feel hungry great photos. Many people love Japan, their food and their culture. After the first visit, they will keep going back and dig out more. The food is one aspect, very cheap and delicious compared to back home. Many people has overlook “chuka”- Japanese version of Chinese food. Most people only eager to eat Japanese sushi, sashimi, kaiseki, okonomiyaki, takoyaki, yakinuku, donburi set rice but I feel “chuka” is one of the interesting cuisine that people should try too. There are so many types of food in Japan, and “Chuka” is the Chinese with the Japanese version. There is also Indian food which is tailored and with the Japanese version, they called it “Indo Ryori” in Japan. I don’t usually prefer Indian food but the Japanese Indian food is an exception for me. Love it. Yum! This looks so amazing! I want to visit Japan and I’ve wanted to ever since I was little! I was always big on anime! I would like to come here and try some of this delicious looking food! Yes, I know so many foreigners love Japan due to their anime. Anime is just getting so big all over the world and most kids are growing up with these anime. LOL. You will not only love the anime in Japan but also the food, the culture, and many other surprises. Yum! I just had some Chinese and I am so full right now. Burp! That hotpot looked especially good. I can imagine myself eating it on a cold day like it is where’s I’m at. Eating in the cold season is really awesome. You are totally right about it. I never thought of a Japanese spin on Chinese food. I would love to try a hotpot meal one day! The mapo tofu hotpot is one of the iconic dishes in Chuka Japanese. Very appetizing!